Kayaking.org, a leader in the online kayaking space has added a new store to their site that features recommendations from real kayakers all over the world. More and more kayakers are looking online when choosing a new kayak and Kayaking.org hopes to be one of the top places they visit this summer. Thanks to a new partnership with Outdoor Play, the web’s first online kayak retailer, Kayaking.org can now offer some of the best kayaks, at the best prices, to their visitors all over the world. Let’s face it, users get overwhelmed on sites like Amazon, they get information overload. “We have always been focused on building a community, this new addition shows how much we can accomplish when paddlers around the world work together,” says Morgan Linton, the founder of Kayaking.org. The new kayak store is complimented by Kayaking.org’s free guide, “How to Choose a Kayak” which turns out to be the most-visited page on the site. New kayakers can learn about the differences between each type of kayak and then instantly connect to an inventory of handpicked kayaks. “Let’s face it, users get overwhelmed on sites like Amazon, they get information overload. Thanks to our community of passionate kayakers we can present the best options to our visitors and help make the process of buying a kayak online easier,” says Linton. This isn’t the first innovation Linton has added in the last six months, in December of last year he built one of the first online kayak booking systems and vowed to become the Expedia of kayaking. As summer approaches, people around the world will be taking to kayaks and hitting the open water. Kayaking.org is hoping their next innovation will make choosing a kayak easier for people who need a break from the information overload of mega-sites like Amazon. “What’s always really excited me about kayaking is the community, now we get to see how the community can have a direct impact on one of the most important decision every paddler makes, how to choose the right kayak.” The store is now live and available to visitors all over the world. Kayaking.org was started in 2009 as a free educational resource for kayakers. 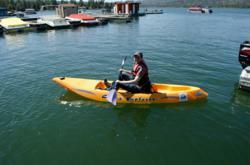 It quickly grew to become one of the top centralized directories for kayaking stores, tour companies, and local clubs. In December of 2011 the company made a bold step forward by adding one of the first kayak booking systems, vowing to become the Expedia of Kayaking. The Kayaking.org blog is one of the most actively updated blogs in the community and is currently run by eight independent Kayakers all over the world. The site was founded by serial entrepreneur Morgan Linton after acquiring the domain name in July of 2008.